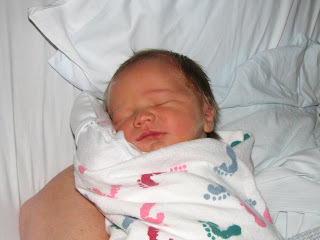 The Bart and Lorna Adams Family Blog: Our Little Guy is Here! Monday, June 22 was delivery day for our "little guy" I called him that until Tuesday evening...now he is going by Branson B. (after MANY hours of trying to name him). I am so thankful for little Branson already! He was born at 2:19pm, was 19 inches, and 7 lbs 12 oz. I am thankful for a perfect little babe (with a hiccup, keep reading)! Everything went great! We had an awesome labor and delivery nurse, thanks Kristen! 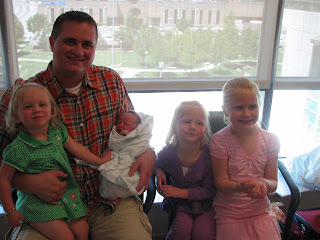 Loyal and Tonia, Bart's parents, brought the girls to see Branson just after the delivery. They were so sweet and very excited! Addie was very excited to hold him, she went right over to a chair, sat down, and held out her arms saying "hoed it, hoed it." 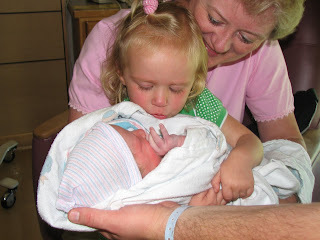 Tuesday morning they checked Branson's bilirubin levels for jaundice, it was 14, at 20 it can be really scary. He's been under the lights, except for nursing, since about 10:00am yesterday. His levels dropped a little and then went up a little. Today is discharge day, but he has to stay in the hospital tonight under the lights. He will be tested again tomorrow to see how he is doing. The hospital has made arrangements for us to stay in the hospital to be with him (we are quite a ways from home). This is Branson sleeping under the lights, check out the cool glasses! 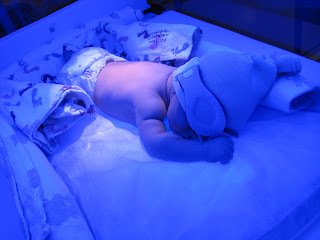 Two of our girls have had jaundice, but I hadn't felt as much of a concern from the pediatrician as I have with Branson. I am thankful for technology to make this better! Thanks for all the support from family and friends, ie phone calls, visits, etc! Bart drove home to get some work done this afternoon and will return tonight. Our girls are being well taken care of by Bart's parents (except I did hear about sunburns from yesterday :) ). So, with ALL of my free time hanging out in the hospital I thought I would post. This is crazy, to not have kids around needing my time and help. I am thankful for a laptop and wireless access to make a quiet, lonely room somewhat homey...with music and the internet. I should probably be sleeping, but I don't feel tired. Congratulations!! What a cutie! And what a fun Father's Day present...one day late. I hope all goes well with jaundice! Congratulations!!!! How exciting!!!! He is adorable.! Congrats! He is absolutely adorable, just like your girls! :) I'm glad you are feeling good and I hope he gets to come home soon! Congrats! He is a little cutie. We really need to plan a reunion with all of our roommates so we can catch up in person and see each others kids! We are so excited you had him and that everything went well. Congratulations!!! I can't wait until we can see him. He is so cute, just like the girls. Hope you can take him home soon. Congratulations!!! He's a cutie. I was wondering today how much longer you had. I am so excited for you. Little boys are so much fun!!! Congrats again! I would love to see you in July, if we can. What a doll. (Can I say that about a boy?) =) But really, I am so glad things are going alright. We are happy for you and Bart. Hope the next few weeks go well. Keep us posted. We are so glad that your baby is here safe and has a name! Congratulations. We can't wait to see him. Oh wow! he's beautiful. Congrats honey! Congratulations....He is a good looking kid must be the Adams coming out in him..We will try and come and see him once you guys get home and settled take care and let us know if you need anything. Oh....congratulations Lorna and Bart!! Branson is beautiful, and I hope he can come home soon. Even though you don't feel tired, you should take the opportunity to rest, pretty soon you will have 4 little ones demanding your time and attention....so get some much needed shut eye!! I love the name it is so cute. Boys name are so hard to think of. He looks so sweet. Let me know if you need any help. Congratulations!! Glad he is here and all is well. He is a cutie! Litte boys are so fun but you will be amazed at the difference between girls. Have fun with that new little guy. I hope we will get to see you over the 4th. Cute, cute, cute! Congratulations! We are very excited for you and hope we can see him when our sniffles are gone. Did your girls tell you we saw them in Provo at Toys R Us while you were in labor? How random! Congratulations Bart and Lorna and girls. We were hoping you'd get a boy. He looks like a cutie. I hope that all is well now. We know all too well what it's like to be stuck at the hospital so far from home. Your girls are getting so big, but still as cute as ever. Lorna, I am so happy for you! How fun to have a little boy. I hope you are adjusting well and being able to enjoy your little one. Congratulations!